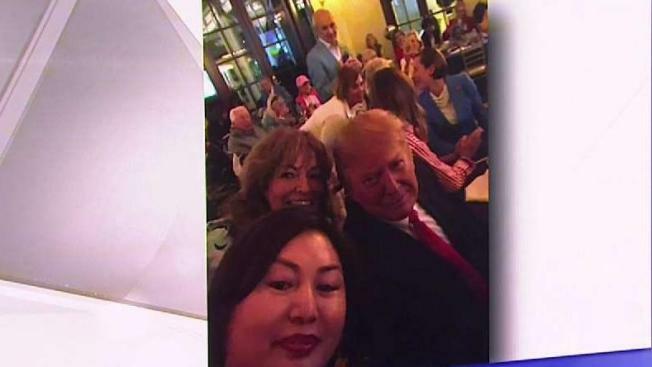 Li Yang with Trump at a Super Bowl party at his West Palm Beach country club and once owned the spa where New England Patriots owner Robert Kraft was charged with soliciting prostitution. A company run by a donor to President Donald Trump claimed it could provide Chinese clients with a chance to mingle and take photos with the president, along with access to his private club in Palm Beach, Florida. It remains unclear how much Li "Cindy" Yang charged for the services and whether she was ever hired to provide them. But the company's claims and other eyebrow-raising activity, which were first reported by The Miami Herald and Mother Jones, mark the latest in a litany of complications and ethical issues stemming from Trump continuing to own and operate a private club where dues-paying members and their guests rub shoulders with the president of the United States and his family, friends, White House staff and members of his Cabinet. The Associated Press has previously reported that aides who accompany the president on frequent trips to the club are always on alert for club members and guests with nearly unlimited access who like to buttonhole the president. They raise pet projects, make policy suggestions and share oddball ideas ranging from the benefits of nuclear-powered cars to personal plans for Mideast peace. Former administration officials have described the lengths to which aides have gone to try to run interference, including reserving the dinner table next to Trump's to keep as close an eye on him as possible and scanning guest lists for visitors who might prove problematic. Yang appears to be a relative newcomer to Palm Beach's political scene. GY US Investments LLC, a company she registered in 2017, according to Florida state documents, describes itself on a now-defunct, mostly Chinese website as an international business consulting firm. The firm "provides public relations services to assist businesses in America to establish and expand their brand image in the modern Chinese marketplace," according to a translation of the page accessed through an internet archive service. The site also featured numerous photographs, including a picture of Trump's Mar-a-Lago club and photographs of Yang with Trump, Florida Gov. Ron DeSantis, Transportation Secretary Elaine Chao and former White House aide Sebastian Gorka. Yang is described on the website as the company's "Founder CEO," as well as a member of a "Presidential Fundraising Committee" and a "Presidential club member." Yang and the company did not respond to messages seeking comment, nor did the Trump Organization, Mar-a-Lago club or the Republican National Committee. But Yang told NBC 6 Investigators, "I go to lots of parties and take pictures." Christian Ziegler, vice chairman of the Republican Party of Florida, played down the significance of the webpage and photos Yang has posted of herself with the president and other prominent Republican politicians. "Anyone can buy tickets to any event and I'm assuming that is what she had done," Ziegler said. "I've never met the lady and I could never pick her out of a police lineup." He added: "I know the media, Democrats, the left is going to try to do everything to connect her with us, but she had zero role with us. It just looks like she attended some events and took some pictures." In China, however, pictures can be an end unto themselves, giving an appearance of influence. Pictures with famous people are especially valued in the country, where personal relationships and connections carry special weight in business and politics. Mother Jones on Saturday detailed Yang's efforts to provide Chinese clients access to Trump and his circle. The Miami Herald on Saturday reported that Yang arranged for a large group of Chinese business executives to attend a paid fundraiser for Trump in New York City at the end of 2017. Only citizens and permanent residents are allowed to donate to U.S. political campaigns, and it would be illegal for foreign nationals to pay back a U.S. citizen who had purchased their tickets to a fundraiser. A Republican fundraiser told the AP on Sunday that patrons attending a Republican National Committee dinner at Mar-a-Lago last year noticed a large contingent of Chinese attendees. There was a discussion afterward about making sure they were vetted, according to the person, who spoke on condition of anonymity to discuss private conversations. The Herald on Friday also published a photo of Yang with Trump at a Super Bowl party at his West Palm Beach country club and reported on the link between Yang and the spa where New England Patriots owner Robert Kraft was charged with soliciting prostitution. Yang was a former owner of the spa. Yang wasn't charged in a multiagency anti-human trafficking operation that resulted in 25 arrests, including Kraft's, and shut down 10 Asian day spas in South Florida last month. None of the spas is registered to Yang or her family. She sold the Jupiter spa to Hua Zhang around 2013. Zhang was charged with racketeering and running a house of prostitution and has pleaded not guilty. Yang told NBC 6 Investigators she "never did illegal stuff" when she owned the day spas. Yang's family still owns several South Florida spas. Schneider contributed from Orlando, Florida. Associated Press writer Zeke Miller in New York contributed to this report.